Ball & Socket Couplings are fast effective means of coupling pipe, hoses, and fittings in for a wide range of applications. In today's competitive agricultural and industrial market, high performance pumps demand high performance couplings. 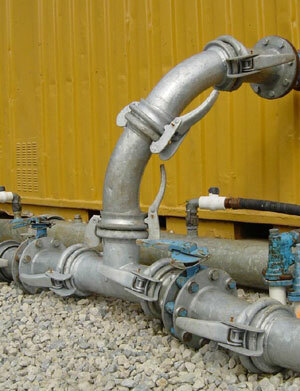 The high degree of rotation couplings allows non-perfect alignment of pipe and hose. 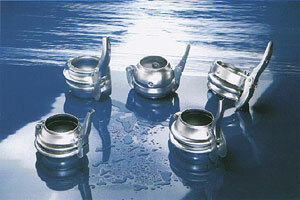 They are not affected by dirt, mud, as are cam-loc, threaded, or bolt-on couplings. The couplings are fully contained and therefore no clamps or other clamping devices that could get lost. 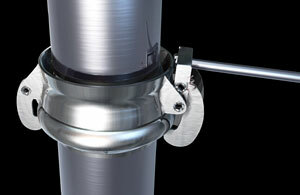 For added locking assurance, a security lock composed of a small hole on the coupling's hooks and a pin acting as a block to avoid accidental opening of the coupling is available on the "D" and "B" series. 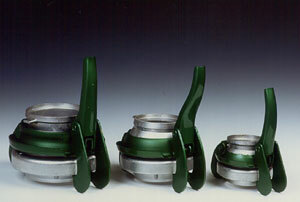 Ball & Socket Couplings are available in the popular Bauer style or the Italian 100/200 Series style. Quick-action couplings in sizes 2" through 12"
D-101 Safety pin optional Economical coupling available in sizes 4" & 6"
A-201 NO safefty pin Largest coupling available in sizes 6", 8", 10", 12"
B-301 Safety pin optional Bauer style coupling available in sizes 2", 3", 3-1/2", 4", 5", 6", 8" & 12"